Pez Cycling always delivers a nice standard read every Monday to catch up cycling news. I'm a big fan. I can't wait to hear the news of which team Classics rider and time trial specialist Fabian Cancellara will be joining in 2011. His transfer has not been announced yet, his exit from Saxo Bank has been announced. 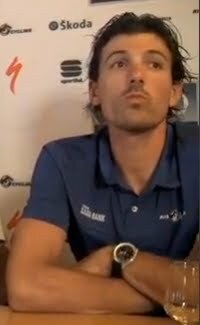 Cancellara's new team could be Pegasus Racing (a new Pro-Team hopeful from Australia, the old Fly VAustralia), BMC, Sky, or the new Luxembourg Team (unknown team name as of yet). Whichever team it is, they will have to come up with a large salary because Cancellara had to buy out his last year contract with Bjarne Riis and Saxo Bank for an expected €3 million ($4 million). Perhaps we should simply ask the question who would Cancellara want to ride with? A non European team (Pegasus), the Schlecks/Voigt/O'Grady (Luxembourg Team), Wiggins (Sky), or Evans/Hincapie (BMC). Cancellara might want to stick to riding with and for his friends. Or ask what kind of bike would he want to ride? Cancellara was an excellent promoter of Specialized equipment. Can you picture him riding a De Rosa (Pegasus), a Trek (Luxembourg), a Pinarello (Sky), or a BMC (BMC)? My guess is he will ride with the Sckleck's on a Trek. "I will decide on Tuesday whether I will go to Australia,"